We have changed the lives of over 350 nurses who have chosen to live and work in one of the most beautiful, multicultural places on earth: Australia. Here, registered nurses are highly respected and enjoy the kind of responsibilities not available to them in India. Nursing jobs can be found in all areas, resulting lucrative career opportunities for Indians who register with Nursing Careers Australia. We can help you and your family visit Australia, enrol your children in school, and find a job for your spouse. So if you have always dreamed of working and living abroad as a Registered Nurse, then Nursing Careers will make it happen for you! Nurses earn from $A5,500 to $A7,000 per mth (2-2.8 lach). Husbands/Wives earn from $A2,000 to $A4,000 per mth (.7-1.6 lach). Nurses have all achieved permanent residence. Education loans have been paid off within 2 years. Savings after exp/taxes approx $A25,000 per yr (10 lach). Nurses have established careers with 85% of our RN’s still with their original employer. Choose the country that best suits your finances and quality of life aims. Look forward to meeting up with you in India! Welcome to the first of our”Where Are They Now” series, which gives you a sneak peak into the lives of some of our nurses. We find out where they are working, what they most like about Australia, and how their lives have been transformed by Nursing Careers Australia. We will introduce you to five successful RN’s who first came to Australia in July 2008. After graduating three months later, they are all now working in some of the country’s most reputable aged care facilities. 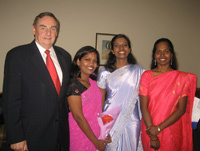 Pictured left from left to right is: Rosamma Thayil John, Sreeranjini Prabhakaran, Vaishali Sharma, Maria Pitman and Teena Thomas at Stanwell Park, looking towards Wollongong where Rosanna now works and lives. The only one missing from the group photo is Jijo Thomas, who lives up on the Gold Coast in Queensland. Three of the five have already been promoted to manager status (within 18 months – we are so proud!) while the entire group has already paid of their loans and now reaping the rewards of earning great money in aged care. Some are in the process of applying for permanent residency, with three expected to receive the relevant accreditation by June. While all of our nurses come from different parts of India, what unites them is the desire to create a better life for themselves and their families right here in Australia. Registered Nurse Rosamma”Rosie” Thayil John was recently promoted to the position of Care Manager at Kennedy Health Care, which is one of Australia’s leading providers of aged care. “At Kennedy Health, we take a holistic approach to caring for the residents and my responsibility is to make the Care Plan for each of the five nurses who work alongside me during each shift,” Rosie explains. 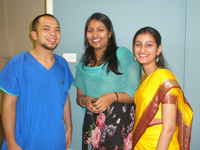 Unlike India’s doctor dominated system, Australian procedures allow nurses to take a more independent approach to their work. Here we have the clearance to plan the resident’s care and I think nurses take more responsibility because of this. “The Gold Coast is such a beautiful place – I love living here! says Jijo Thomas, who works as an RN at Bupa Merrimac.”I have been here for nearly a year and a half and enjoy the fact that in 15 mins you can be on the beach, or you can drive 30 mins in the other direction and you are in the mountains. Either way is just amazing. Jijo recently purchased a Honda Civic, which means he can explore his hometown, which is only a short drive to the New South Wales border.”Everyone is so welcoming and friendly so it is a really nice atmosphere to live and work in. On the weekends, I usually go out fishing with a friend who has a boat and another who has a jet ski. So we spend a lot of time on the water enjoying the sunshine and the sights,Jijo says.”I also have a few friends from India here so we go out to various places – we recently went camping, which was a lot of fun. In addition to soaking up the exciting lifestyle the Gold Coast offers, Jijo also likes the responsibility and independence that comes with working in aged care.”Basically, you are left on your own to take care of the residents – which in my case is around 98 – so you are the person who is responsible for everyone’s health. It’s a huge responsibility but once you get used to it, you really start enjoying it. “The resident’s are always so happy to see you and when you come back to work after a couple of days off, they really miss you! 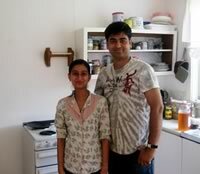 Vaishali Sharma has been living in Australia for nearly two years and is living with her husband Lokesh near Newcastle, just north of Sydney.”I really like the people here – they are so friendly and easygoing, she says. Currently working at Bupa Cardiff, Vaishali and Lokesh are excited to be having their first child, which is due in May.”I don’t have any family living in Australia but have lots of friends, so we are looking forward to raising our family here,she adds. While Vaishali enjoys working in aged care, she is looking forward to one-day working in the fast paced area of intensive care. “Working in aged care is certainly challenging but there is so much job satisfaction and you really feel as though you are doing something important,Teena says.”Nurses are the ones who are responsible for everything and they make most of the day-to-day decisions. Also, as an RN in aged care, you are required to do a fair bit of management that involves giving duties to the assistant nurses, and working in close contact with the families of the residents. Teena Thomas, who lives in southern Queensland with her husband Sam, says she has fallen in love with Australia and”never wants to leave.”I have so many friends here – Indian and Australian – and we often organise social functions through work on weekends, Teena says.”Sam was recently granted an Australian Visa thanks to Allan and Maria’s help so he will be arriving here soon and I cannot wait! Review more casestudies and testimonials on our website.